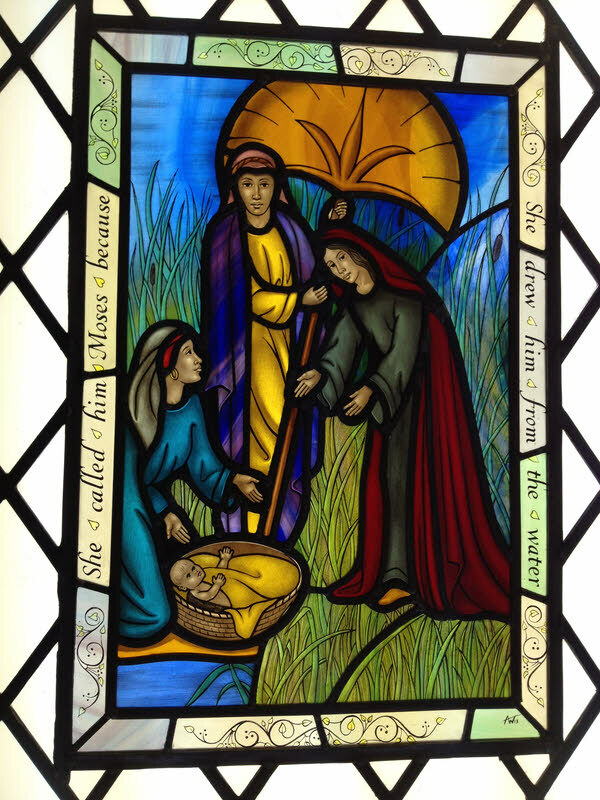 This window was commissioned by a parishioner to be a partner to the existing panel of Jesus as a baby. Fitting that both windows are behind the font. The original design concept was given as inspiration and from that we drew the cartoon. This is an article I wrote about it for the local parish magazine. 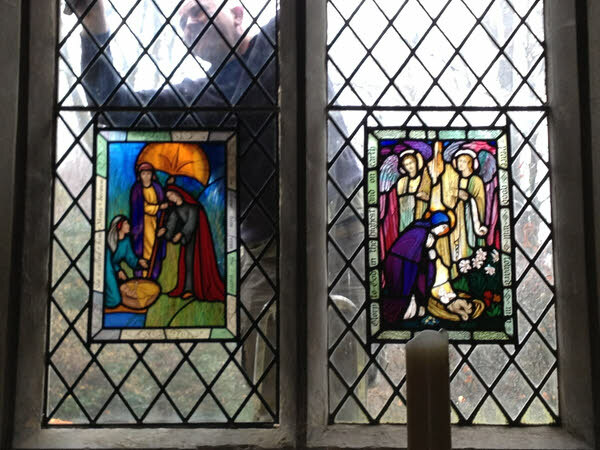 In 2012 I was thrilled to be asked to design and make a window for Christchurch, Coldharbour. Having lived in Abinger Hammer for nearly 18 years ( a new comer I know!) I have yearned for the opportunity to do this so jumped at the chance. Stained glass was originally set into churches to educate an illiterate congregation. The light passing through coloured glass was thought to carry the spiritual light from the heavens into the building. It’s not difficult to imagine how amazed and uplifted the medieval congregation might have been when seeing this coloured light for the first time and the wonderful images it portrayed. In my own humble way I am treading in the footsteps of these artists and craftsmen and am honoured to have my work placed along side some of the most well respected stained glass artists of the 20th Century within the church. My love of stained glass began when I was at Chelsea Art School in 1982 where part of my course studies stained glass. I have been working in this medium constantly since 1986 gaining a solid training in one of the countries leading stained glass companies, Goddard and Gibbs. In The Moses Window I have employed all the traditional techniques used in making a stained glass window. An initial inspiration picture was provided by the donor, Morag, and from this I produced a full size cartoon, a drawing of the image. This cartoon shows all the lead lines and also all the paint detail that will go into the final window. From this I created a cutline, this cutline depicts the heart of every lead and I used this to cut the glass on. I chose the glass very carefully for this project. I wanted it to look contemporary not to look totally out of place to its partner panel. The sky is cut in a rich streaky blue, this glass along with the glass of the fan is some I had saved for the ‘right project’! This is mouth blown English antique glass made by a company called Hartley Wood and Co which sadly closed in 1997. The robe of the fan bearer is cut in new glass, made by the English Antique Glass company and made in the same way as the much older glass, I chose this as it matches the wings in the partner window. The reeds are created on streaky green glass with the addition of some green enamels and some silver stain, a silver oxide painted onto the back of the glass and fired in which creates a yellow and this is what gives stained glass its name! My colleague Norman Attwood painted this window for me. He is now in his 78th year and trained in Westminster, London at the old William Morris and Co in the 1950’s. Norman and I have worked closely together for many years since he joined Goddard and Gibbs in 1992.